It’s our eleventh day on Ko Chang (Thai for “Elephant Island”), but Tim and I still can not get enough of the view from our private bungalow. It is one of the most breathtaking places we’ve ever stayed, and waking up slowly here, with the water reflecting the palm trees outside our door and the mosquito net draped around our bed blowing a bit from the oscillating fans, is one of my most favorite things in the world. Around 10am we hear a friendly voice call out to us, and our friend Klaus has arrived. 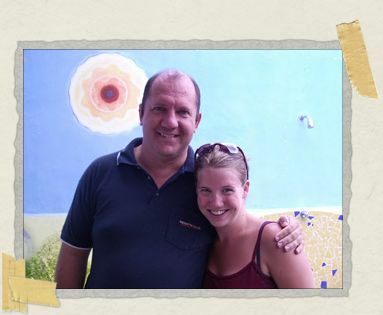 We first met Klaus back in Vilcabamba, Ecuador where we spent many meals together at the Mexican restaurant attached to our hotel. After Vilcabamba, Tim and I traveled for two more months in Ecuador and then across the ocean to Europe, Turkey, and Southeast Asia. Klaus headed south to Peru and eventually made his way home to Germany for a few months before he too headed to Southeast Asia. And as luck would have it, our paths crossed again, an ocean away from Ecuador, on the island of Ko Chang. The three of us have decided to spend the day doing some research on the elephant camp located in the jungle in the northern part of the island. There are two elephant camps on our part of the island, but the idea of riding an elephant next to a road isn’t as appealing (for us or the elephant) as riding one under the jungle canopy. And while we’ve read good things about the camp located in the jungle, Tim and I prefer to see it firsthand before booking anything. After taking a sawngthaew (a pick-up truck with two benches in the back) to White Sands Beach for a quick stop at the 7-11 market and the ATM, we board another truck to the elephant camp (or, as it turns out, to the beginning of the road that leads to the elephant camp). A wooden sign tells us it’s a 3 kilometer walk to the elephants, and a 4 kilometer walk to some waterfalls. With the midday sun pounding on our backs it doesn’t take us long to agree that a dip in the falls might be in order after our visit with the elephants. 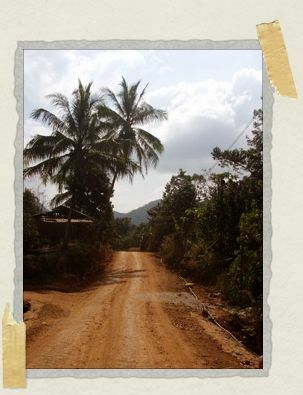 The asphalt road is narrow and curvy and takes us past a part of Ko Chang that we normally don’t see in the more touristy areas of the island. We see rows and rows of rubber trees that the locals are gathering sap from, little kids playing with their brothers and sisters while looking at us with curious eyes, and lazy dogs pretending to protect their bit of dirt yard with a quick bark before returning to sleep. We pass a construction site of sorts where men are building a beautiful looking house, made of dark woods and in the style of a wat with its ornate details. And at one point we see a man hanging newly made sheets of rubber which he had passed through a press of sorts and is now laying out to dry in the heat of the day on sturdy clothes lines. The asphalt road eventually gives way to a red dirt road, and soon enough the red dirt is all over our feet and the lower part of our legs too. It’s at this point that we all groan a collective sigh as we read a sign that says the elephant camp is still 1.5 kilometers away. It appears we’ve chosen the hottest day of the week to do a long walk, and the midday sun makes every half kilometer feel three times as long. Although we are hot, thirsty, and covered in dirt, we are still very happy. The three of us have a great time talking together, sharing stories from our travels and from our homes in the US and in Germany. And Klaus’s ever-present friendly and easy-going manner makes Tim and I almost forget the temperature is over 100 degrees. At one point we stop so I can take a picture of the road behind us. And that’s when we notice them: two elephants appearing from behind some trees with several people walking closely behind. It seems we’re closer to the elephant camp then we thought, and we get to share a few moments with the group as we all walk to the camp together. Ironically the people’s footsteps are louder than those of the elephants. 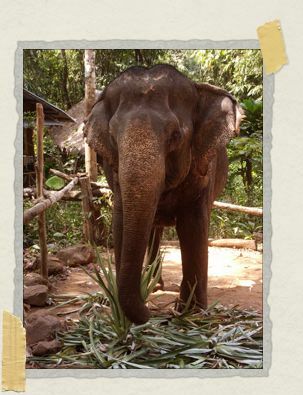 At the camp, we inquire about prices for an “elephant experience” that includes bathing and feeding them. (Klaus, meanwhile, giggles to himself about the absurdity of paying someone to bathe their elephant.) From our limited Thai and the staff person’s limited English, we discover it’s 500 baht (about $12.50 US) for 1 hour or 900 baht (about $22.50 US) for two hours with the elephant. The prices seemed okay, but the number of people in the group we passed wasn’t very appealing, and we decide to give elephant bathing a miss on Ko Chang. Leaving the camp we stop by two elephants, one we learn is named Shirley, and spend some time with them. Tim comments that we’re probably spending more individual time with the elephants than the people who have paid for the experience. Shirley waves her trunk in the air at this statement. Hot, thirsty, and still covered in dirt, we leave the elephant camp and head a further 1 kilometer to the waterfalls. 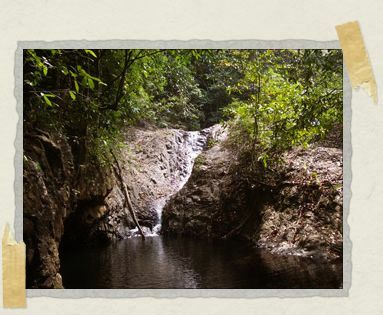 There are several waterfalls on Ko Chang, some located in the National Park area and some located on private property. These particular waterfalls are located on private property and we discover from a friendly sign that they cost 20 baht (about $0.50 US) to visit. We share a few sodas before heading to them, watching the owner’s children playing in the water nearby, and watching the owner make a plastic fish from an old water bottle. Ten minutes later, we’re in front of the first of three waterfalls in this area. It’s the dry season so the falls are rather small, but they probably aren’t large even in the wet season. And although they aren’t in proportion with Iguazu Falls in Argentina (or even my bathtub when it overflows), they do create a gorgeous natural pool of water in front of them. And surrounded by the trees and sounds of the jungle, it really is an idyllic setting. Klaus has come prepared with his bathing suit and doesn’t waste a moment before sinking into the cool pool in front of the falls. Tim and I are not prepared, and content ourselves with dangling our feet in the water. But I vow never again to travel in Southeast Asia without my bathing suit underneath my clothes. After a little bit, we decide to explore the second and third waterfalls too. We climb up a rather slippery hill with jungle to the left of us and water to the right of us, holding on to a rope that’s strung between the trees to help balance ourselves. Although the first and second waterfall are pretty, it’s the third one that is beautiful. The sun light is sneaking its way through the trees at just the right angle here, and the pool of water is even larger. The beauty of it all, and the realization that these are the first waterfalls Tim and I have visited in Southeast Asia, make me decide to go ahead and swim with my skirt and tank top on. Tim needs little convincing and jumps in wearing his shorts, and soon we are paddling the short distance over to the little waterfall. The water is cool, and soon the heat of the 4 kilometer walk is behind us. We ask Klaus, who is drying off on a nearby rock, to capture the moment with our camera. But at that instant our camera battery dies, and we are all left laughing at the bad timing. Always prepared, Klaus takes a picture with his camera and promises to send it to us once he is home in three months time. Wet and tired, it’s soon time for the 4 kilometer walk back into the world. Along the way we can’t resist going down a path that leads to some bungalows in the jungle canopy. When we arrive, the owner invites us to sit on some pillows and relax. We order some pineapple shakes, watch the happy dogs sleeping in the shade, and talk to the owner about the jungle treks he leads in the surrounding area. Tim settles into a hammock, while Klaus and I continue to relax on our pillows, and the next hour passes peacefully with nothing but the sounds of the birds and a small radio. Realizing that if we stay much longer we’ll probably end up renting two bungalows, we continue our walk back into town. Soon enough we’re back, and a quick sawngthaew ride later we’re in White Sands again where we’ve decided to grab some dinner on the beach at a place called Thor’s Palace. With fun music playing in the background (nothing beats listening to a cover of “I Will Survive”) and the sun just beginning its descent over the ocean, we enjoy pad thai and green curry and more than a few beers. An hour later, after a quick stop at a local store, the three of us are back at Tim’s and my bungalow. We’ve decided to watch the sunset from the comfort of our front porch with plenty of Thai beers on hand. Conversation, as always, comes easily and we find ourselves laughing at just about everything. After about an hour, the Russian couple in the bungalow next door get home and we invite them over. Dima and Nadya are spending several weeks on Ko Chang and have explored almost every waterfall and beach there is to see. 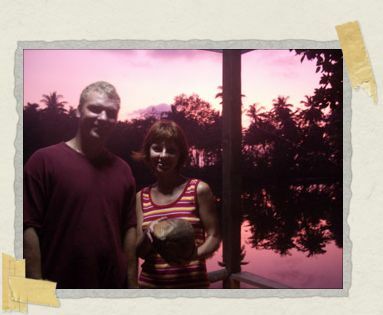 They’ve also taken to “borrowing” coconuts from several of the surrounding farms, and they bring one over to share with the three of us. Tim and I quickly learn that opening a coconut is no easy task as Dima spends the next twenty minutes whacking at it with a very large butcher knife he borrowed from the owner of our bungalows. Half an hour later, the five of us are sharing the fresh milk and the white meat from the inside of the coconut, and it is much better than anything I’ve ever tasted back home. The sun has set and many hours have passed. Another beer run and several candles later, the five of us – two Americans, two Russians, and one German – spend the time telling stories and asking questions of one another’s homelands. Dima’s English is quite good, and it feels like we’re at a United Nations conference as he simultaneously listens to and then translates our stories from English to Russian for Nadya. We enjoy laughing about the way Americans and Russians were portrayed in the movies during the Cold War (Rocky and Rambo quickly come to mind). Recently married, Nadya and Dima tell us what a traditional wedding in Russia is like, which proves to be an adorable story. And after hearing their descriptions of their country, it doesn’t take Tim and I long to declare that Russia will most certainly be at the top of our list for the next country we want to visit after this trip is over. It’s after midnight and Nadya and Dima head to bed, while Klaus, Tim and I spend a bit more time talking. Klaus was at university when the wall between East and West Germany fell, and I ask him what that was like for him as a German. And I realize that times like this, when I can listen to the stories from someone from another country, are my most favorite moments about this trip. The beers finished (or as finished as we can make them), it’s time for bed. Klaus decides to walk back to his hotel via the beach instead of the road, and we watch his silhouette in the distance under the moonlight as he heads home. Happy as can be, we end the day the same way it began, with the view from our bungalow and the mosquito net draped over our bed gently blowing in the breeze from the fans. I think when I've traveled in the past, I've interacted less with other travelers than you guys have. This is probably due more to the kind of travel I've done, but now reading your entries here I'm really regretting not finding other people like Klaus, Nadya and Dima. And laughing at the struggles with the coconut. Beautiful story! Yet I can't help but ask "if you hit a rubber tree does it bounce back and forth with a weird *boing* type noise?" You can probably guess I'd highly recommend a trip to Russia It sounds like a beautiful, perfect day.